Although the Italians had dropped supplies and troops to isolated units during the 1917 battle of Caporetto, the institutionalization of airborne infantry did not occur until sometime afterwards and mainly due to Fascist initiatives to showcase these units as a modern means of warfare. The first paratroop units were organized in Libya in 1938 under the direction of Italo Balbo and consisted of two battalions totaling approximately 300 Libyan Ascaris and 50 Italian officers. A third Libyan battalion was raised in 1940 composed mainly of Italian colonials and was assimilated with the other two existing units into the Tonini Modile Group. The Tonini Mobile Group fought at Derna in January 1941 under 10th Army command and delayed the Australian advance however was eventually destroyed at Beda Fomm in subsequent fighting. Interestingly, Italo Balbo looking for an opportunity to strike a decisive victory against the British in 1940 considered organizing two paratroop divisions in a far reaching attack into Egypt. Training schools were formed at Castel Benito in Libya and in Italy at Tarquinia and Viterbo under the direction of the Regia Aeronautica in 1940. Although training was conducted under the control of the Regia Aeronautica, the tactical deployment of paratroops rested with the Regio Esercito. Three more battalions of paratroops were raised in July 1940 including a battalion of Carabinieri which participated in the Crusader battles of November 1941. This unit covered the flank of the Ariete armored division, however it was eventually overcome in mountain fighting at Jebel Akhbar during the Italo-German retreat at the end of 1941. In the fighting at Jebel Akhbar the Carabinieri fought between December 18-20 facing South African armored cars, part of the Central Indian Horse division and two battalions of the 4th Indian division and held back the 3/1 Punjabis. Several other deployments of paratroop units were considered by the Italian High Command which included air drops on the Corinth Canal, island drops during the attack on Greece as well as air drops in A.O.I (East Africa). The planned drop in East Africa was noteworthy in that SM.82 aircraft would presumably fly non-stop to the East African destinations. Paratroop drops were successfully completed during the invasion of Greece at Zante and Cefalonia in April 1941 however did not encounter resistance. The 1st Paratroop Division was formed on September 1941 under the Command of General Enrico Frattini. The division was composed of two infantry and one artillery regiment plus the 8th Guastatori (Assault Engineers) Battalion. The division was named the Folgore (Lightning) on June 1942. The Folgore trained at Tarquinia and Apulia for the planned invasion of Malta (Operation C3 or Herkules, as the Germans referred to it). Upon the cancellation of operation C3 the division was deployed to North Africa in mid-July 1942 and was formally renamed the 185th Division on July 27th, 1942. Each regiment had three battalions and one company of 47/32 antitank guns with an artillery battalion also equipped with the 47/32 dual purpose gun. The Folgore’s 3rd and 11th battalions remained in Italy along with the HQ of the 185th infantry regiment that would later form the nucleus of the Nembo paratroop division. The total number of men of the Folgore at El Alamein was approximately 3,000. During the Alam Halfa battle the Folgore covered the left flank of 90th Light division, the Ramcke brigade along with some units of the Brescia division. During Operation Beresford the Comosso battalions beat off an attack from New Zealand infantry on the nights of 3-4 September 1942 and captured Brigadier G.H. Clifton with many vehicles and weapons. The Folgore were again attacked on September 30 by the newly arrived 131st British Infantry brigade supported by tanks of the Scots Greys and preceded by a heavy artillery barrage. The British infantry were repulsed with heavy losses and the Folgore inflicted 400 casualties on the British while only losing 45 paratroops. On October 23, 1942, Montgomery launched his main offensive and the Folgore was again attacked, this time by the 44th Infantry and the 7th Armored Division. Two Free French battalions also attacked the Folgore at Naqb Rala on the 24 October and were beaten back by the Folgore’s 5th Battalion and were then pursued by the 33rd German Recce who unfortunately attacked both friend and foe alike. On 25 October the British 4th Armored brigade and the 69th Infantry brigade struck the Folgore again at Dier Munassib but lost 22 tanks. More attacks followed however this time with the 50th Infantry and 7th Armored Division which failed with considerable losses once again. The Folgore reported the destruction of 110 British tanks. These defeats compelled Montgomery to switch his main attack from the "Southern Soft Spot" to his North flank. These new operations were called Supercharge and thus ended operations against the Folgore until a general retreat was called by Rommel on 2 November, 1942. Without transport the Folgore were doomed and final resistance ended on the 5th when the Folgore were surrounded. Only few hundred survived to join the rebuilt 285th Folgore battalion under Cpt. Lombardini which fought again in Tunisia as an organic unit of the Trieste motorized division. The few remaining survivors returned to Italy to join the 185th paratroop regiment belonging to the second Italian Paratroop Division known as the Nembo (Storm Clouds) 184th Division. As in the case of Folgore, the Nembo was employed primarily as an Infantry Division. The Nembo fought against the British 8th Army advancing through Calabria in 1943. A third paratroop division was also proposed named the Ciclone (Cyclone) and 4 battalions were formed in August 1943. The Italian Navy and Air force also organized some minor units for the invasion of Malta but were used in air drops in North Africa to attack air bases near Benghazi. Of interest, in 1942 a paratroop unit was formed composed of former Indian POWs named the Azad-Hindustani Bn. of the Frecce Rosse (Red Arrows) group. The 101st coy, 1st Bn./10th Ariditi (Commandos) and the 1st Paratroop Unit (Airforce) and a paratroop battalion of the San Marco Marines was also formed in 1942. The first airborne unit formed by the RSI was the Italian Paratroop Volunteer Group which was formed from elements of the ADRA, 10th Arditi Reg., 17th, 18th and 20th Ciclone Bns., the 12th and 8th Nembo Bns and one replacement unit of the Nembo then in training at Viterbo. The group was renamed the Nembo Paratroop Group and was assigned to the 2nd Fallschirmjager (FJ) Division. One company of the 10th Arditi Regiment joined the 2nd FJ in its recce units and followed the German Division to Russia and then to Holland where it fought in Operation Market Garden. The Independent Paratroop Bn. Nembo was formed in 1943 from 1,200 paratroopers training with the 4th FJ Division at Spoleto and fought tenaciously against the Allies at Anzio losing about 70% of its strength. 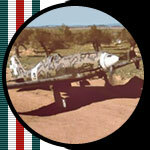 Other paratroop units involved in fighting the Allies included the 3rd Azzuro Bn. at Anzio. Although not fully utilized in their primary role, Italian paratroop units represented the best in the Italian Fascist Military effort in WWII. Italian paratroop units were generally hand picked, relatively well equipment, well trained and highly motivated and proved fearsome in battle to such an extent that Winston Churchill referred to them as the Lions of the Folgore at El Alamein. Such was their elan. Greene, J. and Massignani, A., "Rommel's North African Campaign," Da Capo Press, 1994. Lorioli, A., "Paracadutisti," Axis Europa Journal, Volume III, Number III, Issue 13.